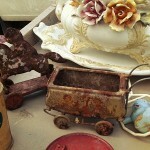 Flea markets have a great history in Malta. Crowded streets, the press of people, yelling merchants, proclaiming their wares as “typically Maltese”, these are elements of Maltese cultural identity. Merchants and their stalls are spread all over the island. Regardless of their shape and size, these markets are still part of our domestic culture. The streets are closed to hundreds of traders who settled in the streets of cities. Product range is huge, so you can buy here toys, house, food, clothes, electronic etc. There are also special stalls with animals, such as songbirds.. This all was held on Sunday morning and tourists were welcomed to buy or see everything interesting for them.